Have you recently been annoyed by ads popping up on your screen? If that is the case, then you might have downloaded Ads by CoolPic on your computer. Before we go into the details of what this adware does, how it works, and where it comes from, we must declare this adware both useless and dangerous. We encourage users to remove Ads by CoolPic as soon as possible, because you really don’t want to subject your system to the potential dangers this adware might pose if it is allowed to continue operating. It uses a catchy marketing slogan, “a cool picture editing tool,” to attract your attention. We warn you that Ads by CoolPic only shows ads and performs no useful functions at all. However, the ads it promotes are not as innocent as they might seem to be at first glance. Oftentimes, Ads by CoolPic imitates an Adoble Flash Player or Java update, but these fake update notifications may be identified by their labeling, such as “Ads by CoolPic,” “brought by CoolPic,” or “by BitCocktail Deal Finder.” It must be said that we do not recommend that you click on any Ads by CoolPic ads whether they are labeled or not, because you might be redirected to an unsafe website that could infect your system with malware. In addition, we also recommend that you not download anything promoted by the ads or the promoted websites. In addition to that, Ads by CoolPic also displays various commercial ads, discounts, and so on. The adware is programmed to suggest offers that the user may be interested in. However, to do this, it tracks the user’s browsing habits and uses the collected information to display tailored content. On top of that, the developers might share this data with third parties. We think users should find this disturbing, because no one would want to share their personal information with illegitimate or shady businesses. The company behind Ads by CoolPic is called BitCocktail, which is known to bundle adware applications with legitimate freeware. The user, however, may choose to decline the offer to install Ads by CoolPic, and we very much encourage users to do so. Nevertheless, the adware may also get itself installed on your system if you click an unknown pop-up message or a suspicious link. In this case, we can only advise you to be careful and not to accidentally click any pop-ups or links on an unfamiliar website. Our researchers have concluded that Ads by CoolPic is a program that users ought to delete without any hesitation, because the functions it claims to perform do not work. Moreover, Ads by CoolPic displays unreliable ads that might infect the computer with all kinds of malicious applications. This will undoubtedly cause major system. 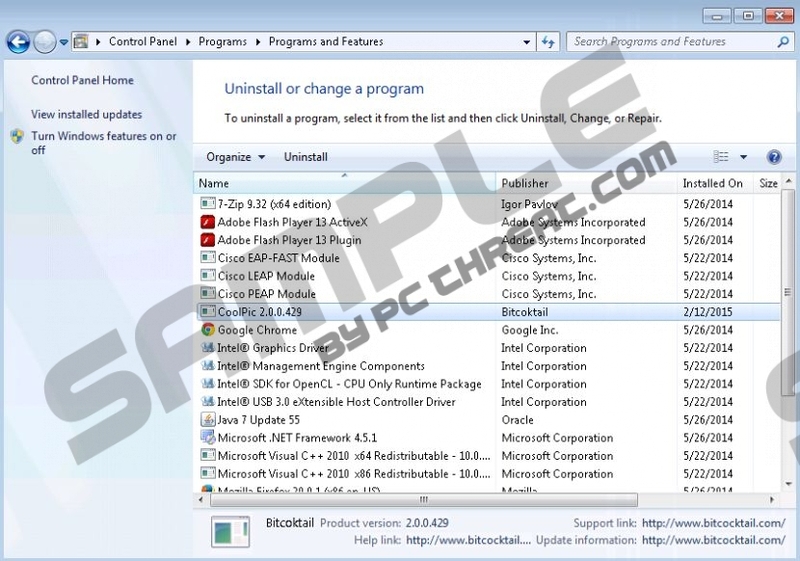 Users may choose to remove this adware manually via Control Panel or by installing an antimalware scanner. Our researchers recommend using SpyHunter, which will not only remove adware such as Ads by CoolPic, but will also remove all dangerous malware applications regardless of their severity. Quick & tested solution for Ads By Coolpic removal.